Arslan’s ever-growing army prepares to march and retake Ecbatana, capital of Pars. They will start by taking the Keep of Saint Emmanuel, a fort along the way. 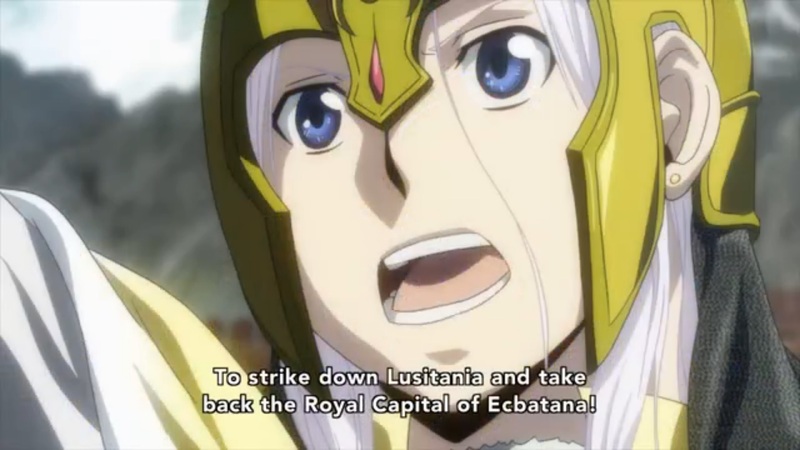 But before any of that, Arslan must quiet the dissension within his own ranks. 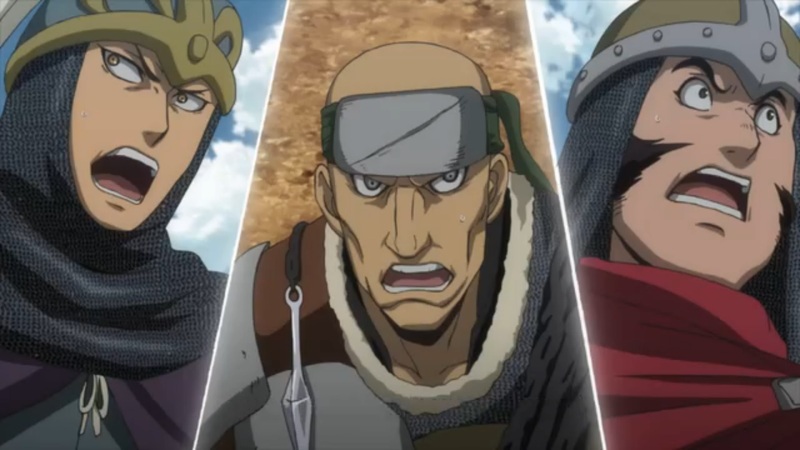 Much as in the previous episode, some of the new leaders don’t trust Arslan’s inner circle, and further changes are made. As the march begins, those same leaders charge forward, eager to prove themselves but wildly underestimating the Lusitanian forces. They are soon cut off in mountainous, unfavorable terrain, and Arslan must decide whether to abandon them or halt his march to rescue them. Slowly, the changes initiated in the previous episode are beginning to be felt. 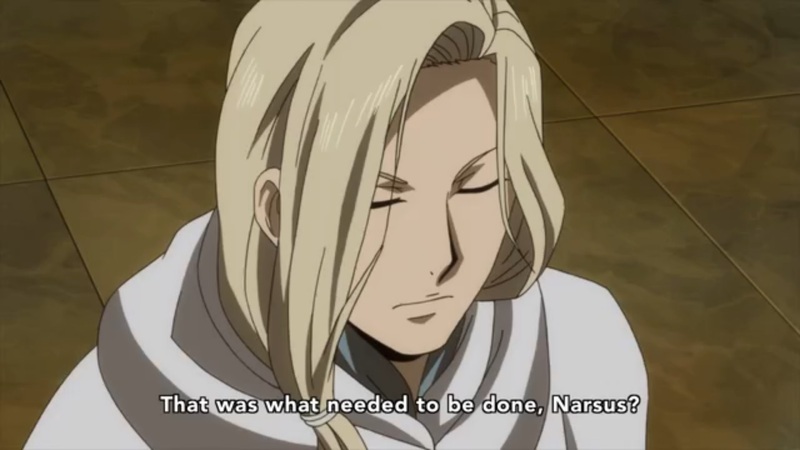 Arslan is juuuust starting to make the slightest decisions without asking Narsus first. His inner circle is also starting to change with the addition of Lucian. 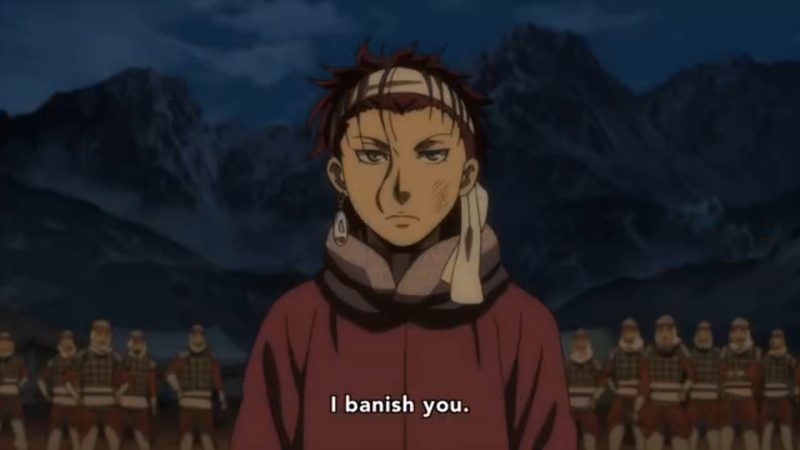 Gieve is also banished by Arslan, and takes his leave from the group. 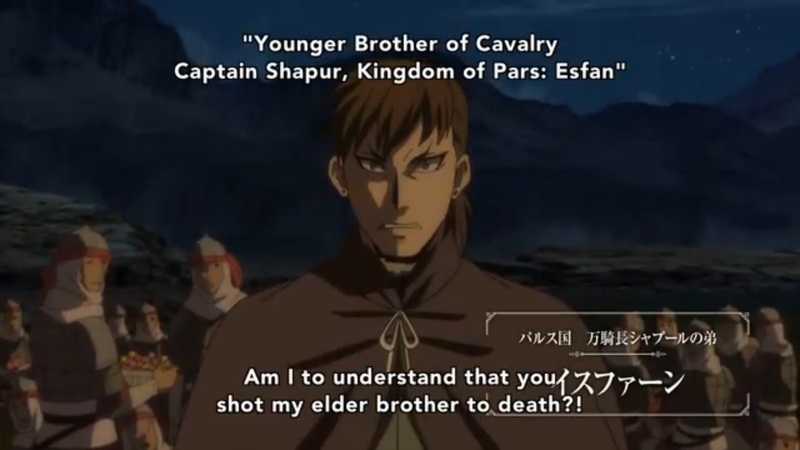 This is done on purpose, in a drama manufactured to stop the new additions to the army from questioning why a traveling minstrel is among Arslan’s top advisers, but it’s still good to see things being shaken up. And yet, for all that, this episode just did not grab me, and was… tedious, in a word. Let’s dig in. The first problem with the episode was that it focused on these losers. These three are the face of the growing pains the army is facing. 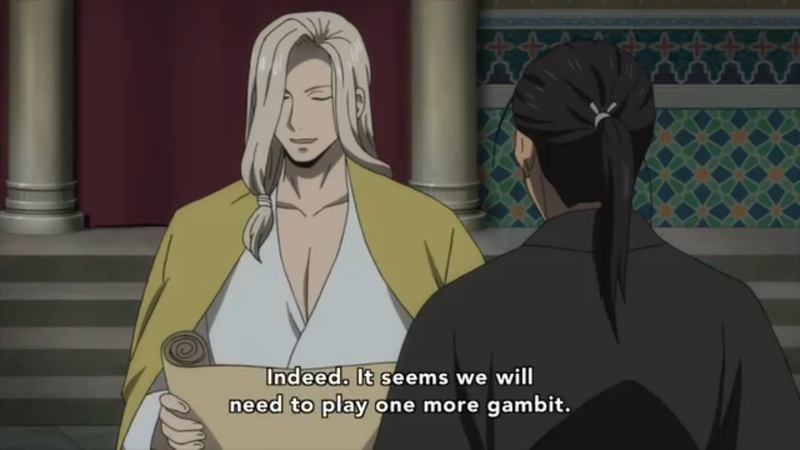 They are meant to be a different kind of challenge that Arslan has to overcome to be an effective leader, and the problem is that “a challenge” is all they really seem to be. The two on the left and right of Zaravant there don’t even have personalities, and Zaravant himself is just a collection of unlikable traits. Boorish. Loud. Racist. Hot-headed. Incompetent. There isn’t a single good thing to say about him, but his shenanigans drive the entire episode. First he gets into another fight with Jaswant over wanting to talk to Narsus about getting his men out of the rear of the army. Narsus personally takes time out of his day to give this demand its undeserved consideration, and eventually puts Zaravant and company at the front of the army. Then he gets into a fight with Gieve over nothing. This causes the manufactured drama, and Gieve is banished. 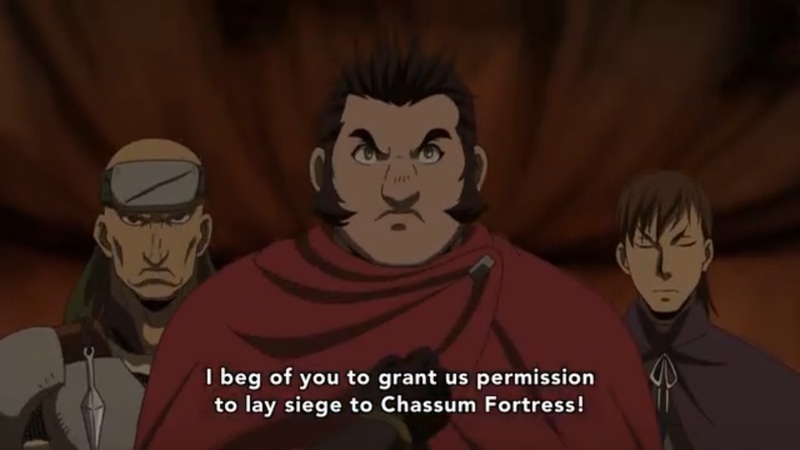 Chastised and shamed, Zaravant shuts up… until the next day, during the strategy meeting, where he asks permission to deviate from the plan and lay siege to an inconsequential castle that no one cares about. 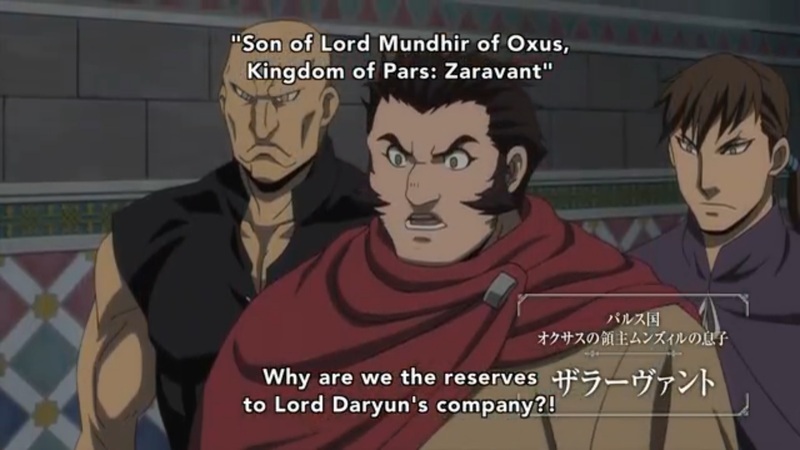 This time, Arslan himself has to personally appeal to Zaravant to back down. Finally, Zaravant falls into line. Just kidding, he and the other two take the first opportunity to lead thousands of men into an obvious Lusitanian trap, getting cut off from the army and fleeing deep into maze-like, mountainous terrain where Lusitania has the obvious upper hand. Where did that weird ninja garb come from? What are you, right out of Naruto? 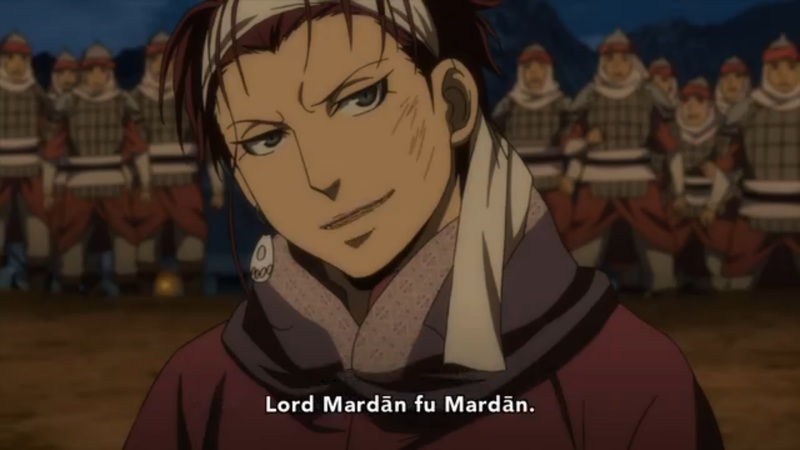 This forces Arslan to decide what to do about them, and, like the good person he is, he halts the entire army to search for the Triple Threat. Arslan once again tells them he wants them to live instead of being idiots, and they’re duly contrite, but I just couldn’t care less. Also, I know Gieve being banished was part of a plan, but if you can get banished for getting in an argument over nothing, how does it look when losing hundreds of men and delaying an entire army gets you a scolding like a mother’s gentle whisper? 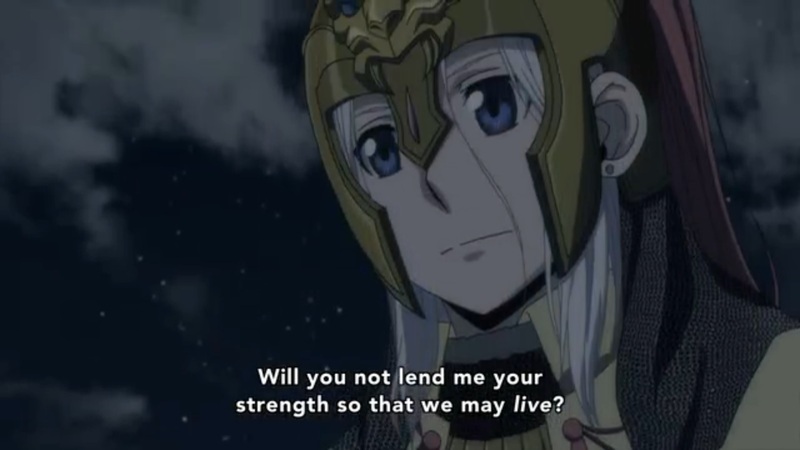 I would look at Arslan and wonder if he was entirely stable. Anyway, by the time they’re rescued, the entire episode is over, and I couldn’t be happier to be done with this boring distraction. An aside: You know how being bored can be made a whole lot worse by having a brief moment of fun that only serves to remind you just how bored you are? 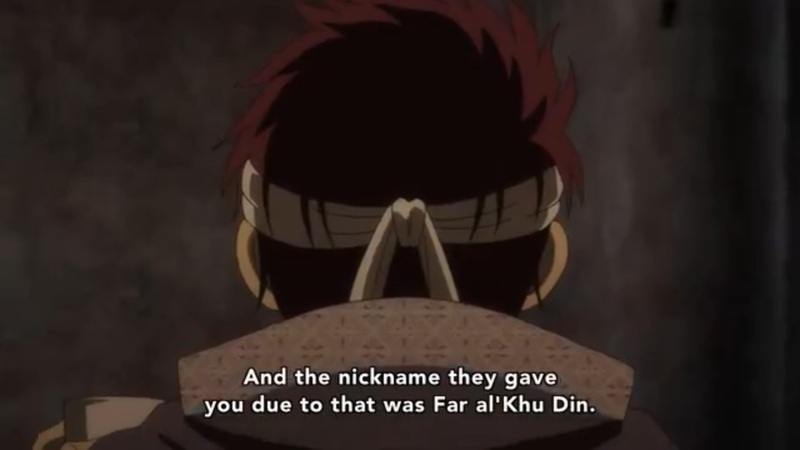 Well, we get a glimpse of Kubard, who is teetering on the edge of deciding to join with Arslan, and is pushed in that direction by a clumsy assassination attempt by Xandes. The scene was brief, and made me think one thing – why am I not watching the awesome womanizing drunkard’s one-man adventure to find Arslan? His story looks so much more interesting than following the Three Blind Mice. The episode, as mentioned, also saw the departure of Gieve. While the reasons why he ended up having to leave were set up pretty well, the actual scene was bizarre and confusing. It starts, apropos of nothing, with this guy accusing Gieve. Who? What? Who is this clown? It turns out the soldier that Gieve shot at super long range way back during the siege of Ecbatana is this guy’s brother, and now, out of nowhere, the issue has blown up. Gieve responds by… reciting Esfan’s entire backstory to him? Like, he was raised by wolves and has a secret nickname? How do you know this random guy’s entire life story, Gieve? With no time to ponder this, Daryun shows up to start the staged confrontation. Gieve decides that he’s the Parsian Oprah, and its time for nicknames for everyone! What does that even mean? Daryun acts like it’s a big insult, but it comes out of nowhere and I certainly didn’t feel the weight of it. 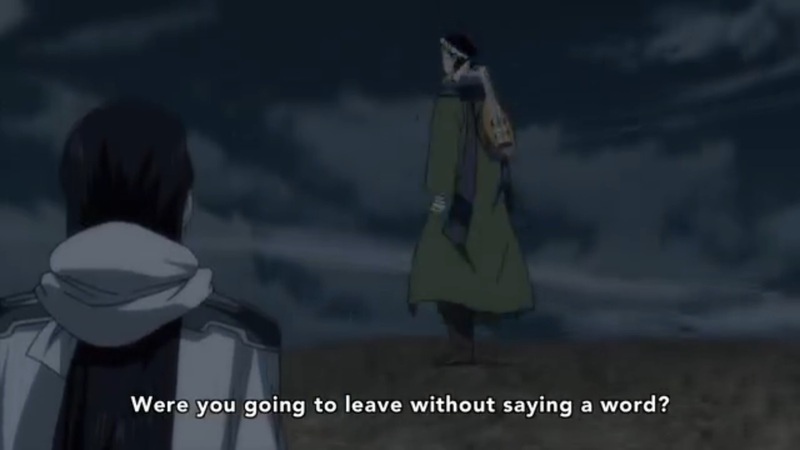 The whole thing feels like Gieve had some really important lines that his character was supposed to say, like from the manga or whatever, and since he’s leaving this episode, he has to spit them all out before he goes. Oh well. The kicker, though (awww, you knew it was coming), was that everything in the whole episode was Narsus’ plan. The fight between Gieve and Daryun? But surely, losing Gieve is an inconvenience, right? Oh. 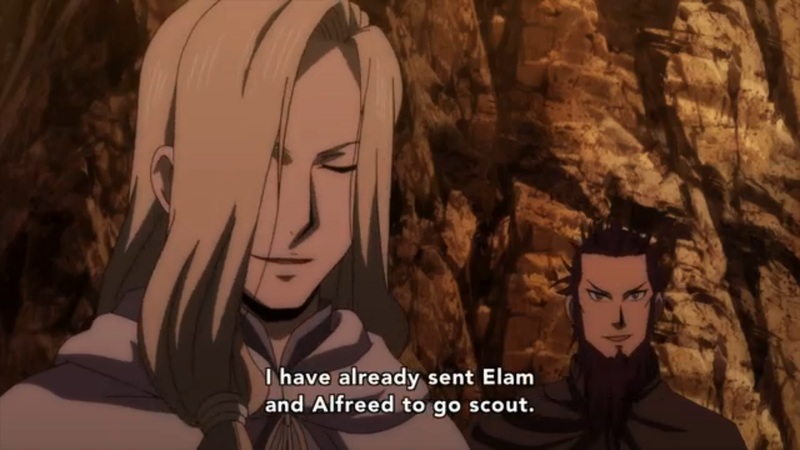 How about when Arslan needed to decide whether to halt the army to look for the Three Amigos? Ah, of course. It was never a decision at all. Thanks, Narsus! Oh, COME ON! Come on! Come ONNN! Gieve was, what, tailing them the whole time into the totally out of the way mountains and somehow played his instrument loudly enough over the sound of battle to reach Farangis? 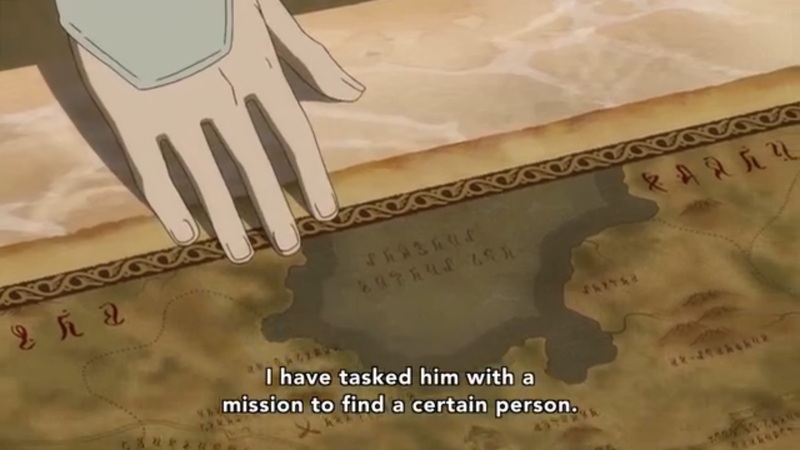 I… I just… is it so much to ask for Arslan to have to make one decision on his own, or make a single mistake, or find himself in a no-win situation? 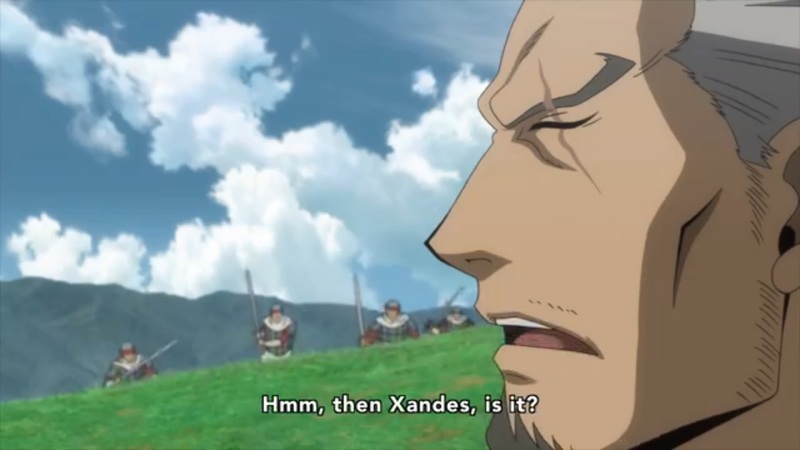 Will he always have Narsus there to ask? Sigh. At least Arslan is starting to break out of the Narsus comfort zone a tiny bit, issuing some orders without asking first (though Narsus has, of course, anticipated all of them). He doesn’t have much time to come into his own before what is shaping up to be a climatic battle with Lusitania, though.